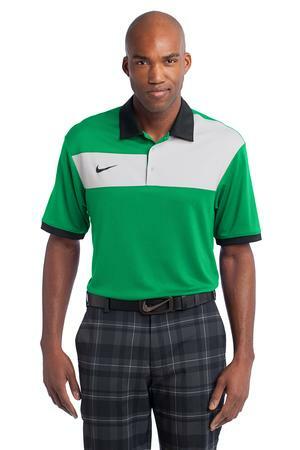 The Nike Golf Dri-FIT Sport Colorblock Polo Style 527806 is available in Adult Sizes: XS-4XL and comes in Lucky Green/Grey/Black, Black/Flint Grey/Black, Game Royal/White/Black and Navy/Gym Red/Flint Grey. The Sport Colorblock Polo is available in men’s sizes XS-4XL and is available in the following colors: Lucky Green/Grey/Black, Black/Flint Grey/Black, Game Royal/White/Black and Navy/Gym Red/Flint Grey. Features of the Nike Golf Dri-FIT Sport Colorblock Polo include the following: Colorblocking on the chest challenges the traditional polo, while Dri-FIT moisture management technology helps keep things cool. Features a self-fabric collar, three-button placket and open hem sleeves. The contrast heat transfer Swoosh design trademark is on the right chest. Made of 6-ounce, 100% polyester Dri-FIT fabric.